If you were injured in a car accident and don’t have health insurance, it is very important that you speak to an experienced personal injury lawyer right away. An experienced personal injury lawyer will be able to refer you to doctors that can provide medical treatment for you now and will wait to get paid until your car accident case resolves. Do not expect the other party’s car insurance to send you to doctors or setup any type of medical treatment for you. Furthermore, do not expect the other party’s car insurance carrier to pay for your medical treatment as you go. Car insurance carriers will not pay for your ambulance ride and emergency room treatment while you are stilling receiving ongoing medical treatment. They will want to resolve your entire bodily injury claim, including your claim for pain and suffering, before they pay for any of your medical bills. If you need to get any medical treatment in the future, and you have already signed a bodily injury settlement release, the car insurance carrier is no longer responsible for any of your medical bills or pain and suffering. As soon as you sign a settlement release, the other party does not have to worry about paying you anything anymore for your medical bills, lost wages, nor pain and suffering, no matter how badly you are injured. The other party’s car insurance company will also attempt to pay you less than what you are billed. 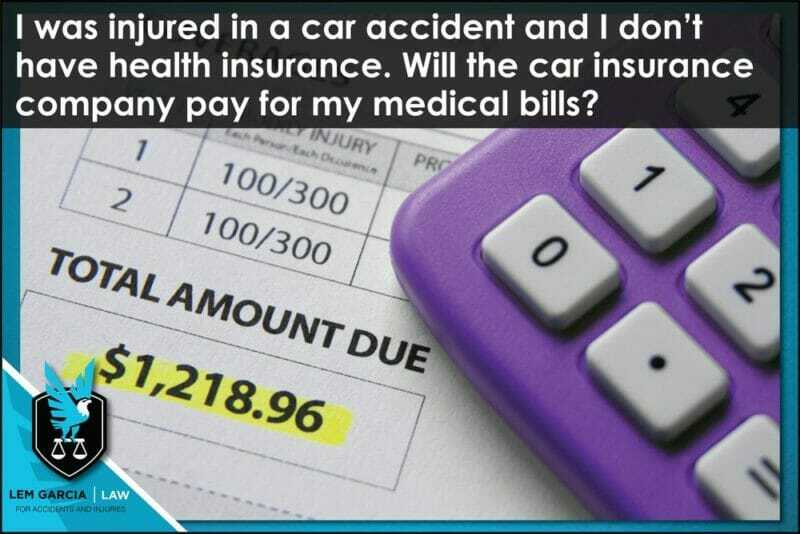 For example, even if you are bill $1,500 for an ambulance ride and $2,000 for emergency room treatment from the hospital, the car insurance company will argue that the ambulance company and the hospital are billing too much and will attempt to pay you less than what you are billed. In this situation, they might try to pay you $1,000 for the ambulance ride and $1,000 for the emergency room bill, even though the ambulance company and the hospital company expect to get paid in full. If you have been injured in a car accident, we advise that you speak to an experienced personal injury lawyer right away. A lawyer will be on your side and look out for your interests. You have nothing to lose and everything to gain by getting advice from an attorney. At Lem Garcia Law, case consultations are always free and without any obligation. West Covina car accident lawyer, Lem Garcia, is happy to help people in their time of need.